The powerful Legend of Acrius weapon is one of the single best shotguns you can get in Destiny 2, but it's a tough road to get hold of it. In this Destiny 2 Legend of Acrius guide, we'll be detailing how to get the Legend of Acrius in Destiny 2, so you can wrap up the World-Eater quest line as easily as possible. But if you instead need anything else at all on Destiny 2 that isn’t about getting the Legend of Acrius Exotic shotgun, including a walkthrough of every Crucible map in the game, as well as a guide to every Crucible mode, make sure to check out our Destiny 2 guides walkthrough hub. As we mentioned previously, you will have to complete the Leviathan Raid, the debut Raid in Destiny 2, in order to be in with a chance of obtaining the Legend of Acrius Exotic shotgun. Take it from us that this is no small feat, so head over to our Leviathan Raid walkthrough guide if you need a hand on solving every puzzle that Emperor Calus throws your way. The Legend of Acrius shotgun in action. Once you're past the Leviathan Raid, you're fortunately done with the most challenging activities that the World-Eater quest will throw your way. Still, check out the steps below to fully wrap up the World-Eater quest and get your hands on the Legend of Acrius shotgun. First, head to Benedict 99 40, located in the Traveler social hub near Hawthorne. Next, complete the End the Arms Dealer Strike that Benedict gives you. This Strike has a severe time limit, so keep an eye out for blue nodes that you can shoot to buy your Fireteam an extra 30 seconds. 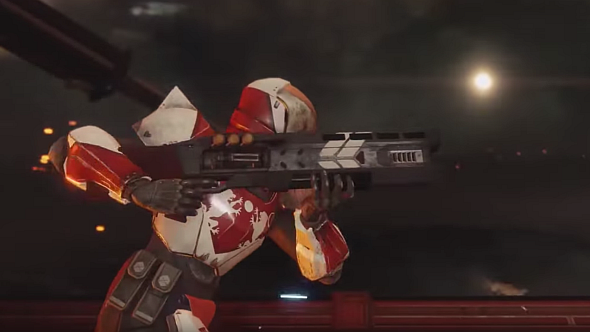 Once you've completed the End the Arms Dealer Strike, you'll be given the Legend of Acrius shotgun. Congrats! How good is the Destiny 2 Legend of Acrius Exotic Shotgun? So, as for the Legend of Acrius shotgun itself, just how good is this weapon? Well, check out the video just below for a complete breakdown of the weapon itself, but the Exotic weapon comes with a damage output rating of 295, ranking it as one of the best shotguns in Destiny 2. The Legend of Acrius actually has a pretty lethal range factor. If you look at the statistics of the weapon, you'll see that the range level is actually near maxed out, meaning it can prove to be a wicked weapon for use in the Crucible against other players.